Earlier this month we saw analysts Brian White and Peter Misek coming up with their research findings stating Apple will release the new iPhone in multiple colours and sizes. Now KGI Securities analyst Ming-Chi Kuo, who has been pretty accurate as far as Apple's product plans are concerned, has now offered his predictions stating that Apple will launch the majority of its new products in the third quarter of this year. Peter Misek's research findings offered more details about the iPhone specs that include a new super HD camera/ screen, a better battery and NFC along with an IGZO screen for Retina+ and 128GB storage. 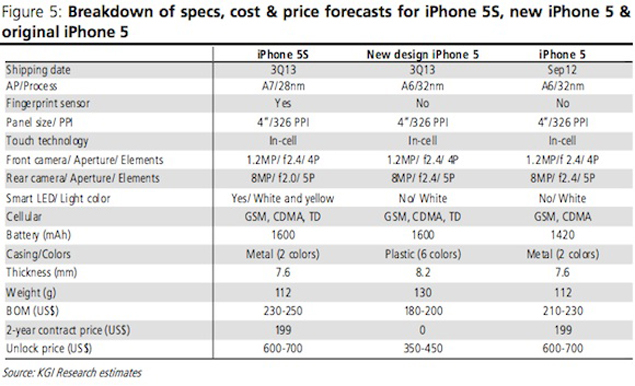 Kuo further adds that there will also be a low-cost revamped iPhone 5 priced between $350 to $450, sport a slightly thicker (8.2mm) plastic encasing and will be available in six colours. In his report, Misek mentions a budget iPhone offering at a $200-$250 price point on an "unsubsidised basis", but claims that the project has not yet been given the go-ahead. Moving on, Kuo forecasts that the next generation iPad and iPad mini will be launched in Q3, with the iPad mini receiving a Retina display. The new iPad is expected to get a design makeover sporting slimmer bezels as seen in the iPad mini. Kuo predicts that the fourth-generation iPod touch will be scrapped and Apple will launch a toned-down fifth-generation model with a lower 8GB storage and no rear camera at about $199. As far as MacBook Pros are concerned, Kuo believes that the non-Retina display models will be done away with this year, featuring just an all-Retina display lineup with minor design tweaks at cheaper prices. He further adds that the MacBook Air will not get a Retina display, courtesy its design, but the processor might see an upgrade. Similar will be the case with iMacs, which won't see a Retina display this year. He forecasts a shift to the Haswell platform for the iMac and Mac mini in Q4. Kuo feels that Apple TV will get minor enhancements but offers no additional details. However, he notes that Apple's highly anticipated launch of a branded television in 2013 is unlikely due to content issues and lack of television industry experience.